Even though most women will experience a natural menopause, some women will undergo surgical menopause, which involves the removal of both ovaries in women who have yet to reach natural menopause. It tends to occur as part of a hysterectomy, which is the removal of a woman's uterus. If, however, a woman has both ovaries removed after she has already reached natural menopause, she will not experience surgical menopause and she will not experience the hormonal changes that occur after the procedure. If you are wondering why the removal of a woman's ovaries results in menopause, you have to first understand the role of the ovaries. Ovaries are the primary source of the hormones oestrogen and progesterone. Once they are removed, a woman's hormone levels fall rapidly, which quickly leads to the physical and emotional changes associated with menopause. Whether those changes trigger hot flushes, fatigue, night sweats or any number of menopausal side effects, it can be a difficult time for a woman as her body adjusts to the new hormone levels. Why is Surgical Menopause Necessary? Women who have surgical menopause may have suffered from a condition relating to their reproductive organs. A woman may have endometriosis, prolapse of the pelvis, ovarian cancer or ovarian cysts. As a result, it may be deemed necessary for a hysterectomy with removal of the ovaries. Once the woman's ovaries are removed, they are not available to produce the oestrogen and progesterone as they did prior to the surgery. While there is a recovery period, the procedure is generally considered important for maintaining women's health. There are several differences between the two kinds of menopause. With surgical menopause, the menopause is very immediate and it occurs right after surgery. 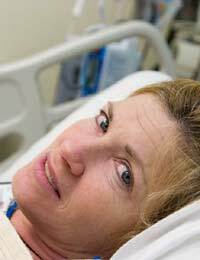 One day the woman is having her menstrual cycles and the next day following surgery she is postmenopausal. In contrast, a woman who experiences natural menopause typically does so gradually over many years. Also, a woman who has surgical menopause will have a sudden onset of intense symptoms in comparison with women who have natural menopause. Usually, women with surgical menopause are younger in contrast to women who experience natural menopause. A woman who has surgical menopause must deal with the surgery recovery itself as well as the healing from the mental and emotional changes due to the reduced hormone levels. Women who do undergo surgical menopause have an elevated risk for cardiovascular disease and osteoporosis. Oestrogen has a protective effect on many body systems, which means that an earlier menopause due to surgery can compromise your health. You may be a candidate for Hormone Replacement Therapy (HRT), although it still brings with it various risks as well. If you have undergone surgical menopause, then you should speak to your doctor about the appropriateness of treatments. While some women do receive oestrogen following surgery to help manage the intensity of the changes, others may personally choose not to receive oestrogen or their doctor may feel other risks of the hormone mean it is not appropriate. Most women will need to take some bed rest time to allow their body to heal. Although the surgery itself can sound frightening, the conditions that women may suffer from prior to the surgery can actually mean that they feel quite relieved to have surgical menopause. Despite the intensity of the postmenopausal symptoms, prior symptoms related to their health condition such as heavy bleeding and pain can mean that the surgical menopause allows the woman to ultimately regain her health. It's not an easy process to experience surgical menopause as part of your hysterectomy, but your reproductive system is not essential for you to have a healthy, happy life. For some women, surgical menopause will bring with it the relief of not dealing with the prior health condition each day. The initial recovery can be challenging as your body adjusts to the loss of oestrogen and progesterone but in time, you will heal physically and emotionally. You can use the support of your medical caregivers, friends and family to obtain a full recovery.